I had Tell Me Three Things on my TBR for over two years, which is long enough that I don’t even know what prompted me to add it in the first place. I finally bought in possibly my biggest book haul ever during the Book Outlet Black Friday sale, and now here I am, reading it. Now what did I think? It’s not the end-end of the world. Just a plot vortex I fell into for a while. 📌 Why is Jessie the snarky teenage version of me? Her dad just hauled her across the country to adopt a whole new life so girl, I GET IT, snark is required. I enjoyed her eye-roll moments and general kinda-done-with-it mood, which is pretty much how 99.9% of the teen population acts nowadays. 📌 I was swept into the whole “who is S/N” mystery even though, yeah, the answer was kinda obvious. Buxbaum threw in enough question marks to keep the mystery aspect enjoyable. I was laughing during the reveal moment. Fun read, good laughs, cute family moments. 4 crowns. Why do I have a whole rating section when I summarize the whole thing ^^ up there? Hmm. I may need to rethink this. Does this section help anyone or nah? Did I finally write an actual mini review? My fingers are crossed. Posted on February 12, 2019 February 8, 2019 by SHA @ Book Princess ReviewsPosted in Book Reviews, UncategorizedTagged book blog, book blogger, book blogging, book review, books, contemporary, contemporary fiction, fiction, review, young adult. I liked this book too when I read it last year. Have you read Windfall? Forgot who it is by, but it has a green cover and it’s young adult. I can see it on my bookshelf at home clearly. I read that one about the same time. No I haven’t read Windfall. Does it share similar themes? I remember I read Windfall on an off day. The girl in Windfall wins a lottery ticket for her best friend’s birthday and it becomes one of those stories. It’s more similar to Lucky in Love by Kasie West. This is such a cute mini review! I read this book a few years back, and found it was just too predictable for me. 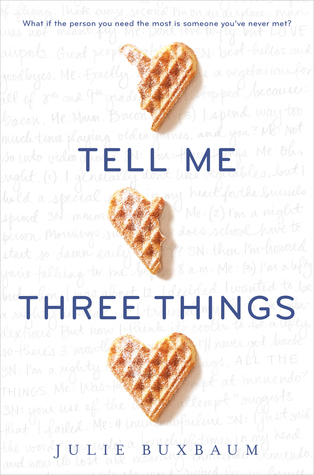 But I still adore the cover, and I’ve enjoyed some other Julie Buxbaum books. Haha, thanks Malka. I go crazy with formatting sometimes. Predictability lost this book some points for me as well. Seems I’m not the only one who let this book sit around for a while. There’s nothing world-shattering about TMTT, but it’s good if you want a little intrigue in an otherwise contemporary read. I read this book back in 2015, and it kicked off my love affair with Julie Buxbaum. It was just the perfect amount of cute and fluffy with some grief thrown in there (which you know is my thing). I just remember loving this book so much. Despite my minor issues, I really enjoyed this book. I can see myself reading more by Buxbaum. What would you recommend as a next go-to from her? I loved After You. I have not read her other YA books (yet), but I liked her adult books a lot. Okay, I’ll give After You a look! The gmail address woooo. That’s embarrassing. Great review, Sha! This is most def a mini review! and that’s not even my real gmail address because my real gmail address is worse. and if we use google drive you will see.